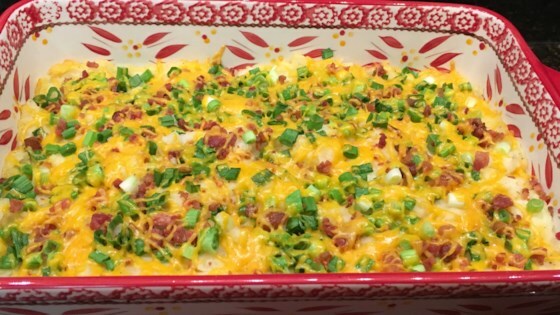 "Great and easy potato casserole packed with bacon, Cheddar, and green onions." Place potatoes into a large pot and cover with salted water; bring to a boil. Reduce heat to medium-low and simmer until tender, about 20 minutes. Drain and return potatoes to pot. Meanwhile, arrange bacon in a large skillet and cook over medium-high heat, turning occasionally, until evenly browned, about 10 minutes. Drain bacon on paper towels and crumble. Combine 1 1/2 cup Cheddar cheese, evaporated milk, sour cream, salt, and black pepper in the pot with potatoes. Mash with a potato masher until creamy. Spread potato mixture into prepared baking dish. Bake in preheated oven for 25 minutes; sprinkle with bacon, green onions, and remaining 1/2 cup Cheddar cheese. Return to oven and continue baking until cheese is melted, about 5 minutes more. I overhauled it with butter and half and half, took out the evaporated milk. I give it points for giving me the idea! Mine turned out AWESOME!